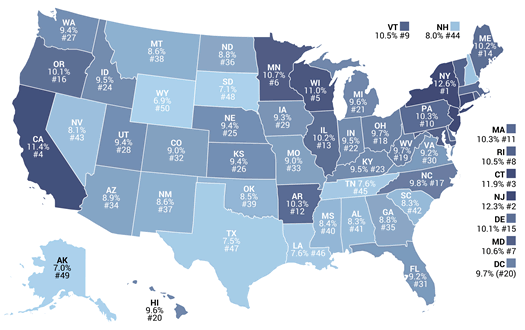 You might have seen that map floating around online recently about "the real value of $100 in each state" -- and New York State had one of the lowest "real" values of any state. That map was based on figures published by the federal Bureau of Economic Analysis. And one of those figures is something called the regional price parities (RPPs) -- an attempt to measure how much goods and services cost in an area compared to the rest of the country. You can probably now guess why the state level number for New York is kind of misleading -- if you're lumping in numbers for New York City with numbers for, say, Utica, it's going to be skewed. And to the credit of the think tank that made that state map -- the Tax Foundation -- it followed up this week with a similar map based on metro areas. Anyway, this is just a long setup for looking at RPPs for metro areas around New York State. There's a static map above for the RPPs for all items across the state's metro areas -- and a clickable map after the jump. 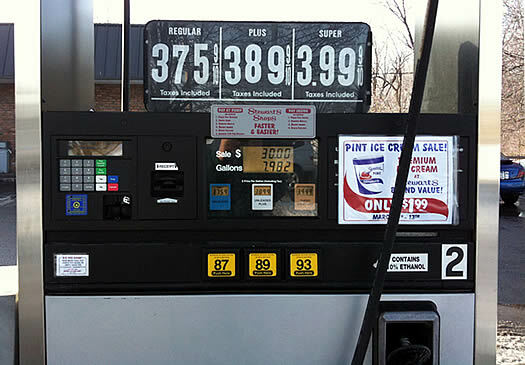 And as you can see, most parts of upstate have prices that are about average for the nation -- or lower. Tucked in that request for proposals for the sale of part of the Harriman State Office Campus in Albany was an interesting list: The largest private-sector employers "within commuting distance" of the site. We've seen similar lists before. The state Department of Labor publishes lists for the state and individual regions (last update March 2014). But that list doesn't include job counts (the labor department cites confidentiality) -- and the one in the RFP does. Clipped from the Economic Policy Institute Family Budget Calculator. Numbers are in 2014 dollars. 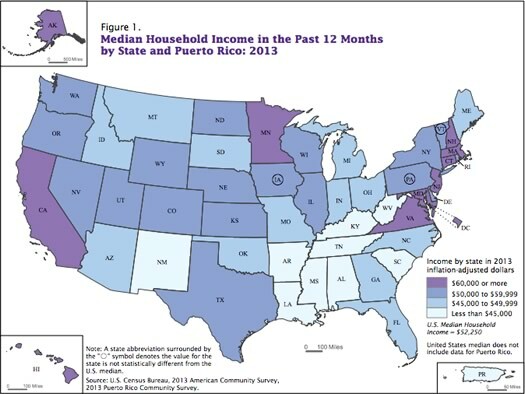 Poverty thresholds are generally national income levels used to measure the number and share of Americans who are economically deprived. Conceptually, these measures are important metrics, but are fundamentally different from EPI's basic family budgets. Families above poverty thresholds are just thought to be free of outright material deprivation. In contrast, family budgets offer a broader measure of economic adequacy by measuring the dollar amount necessary for families to live securely but modestly in various communities across the nation. As with anything like this, the methodology is going to make a difference in the outcome, and EPI documents the recipe it used. 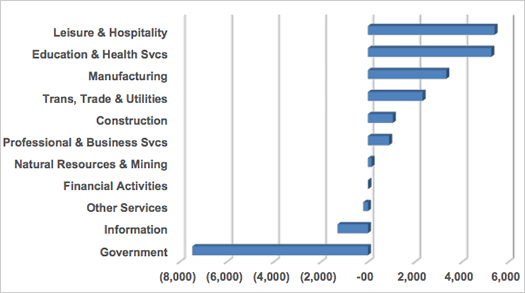 That graph above depicts the numbers of jobs gained and lost, by sector, in the Capital Region between 2009 and 2014. It's from NYS Comptroller's Office report out Monday looking at employment trends across the state. 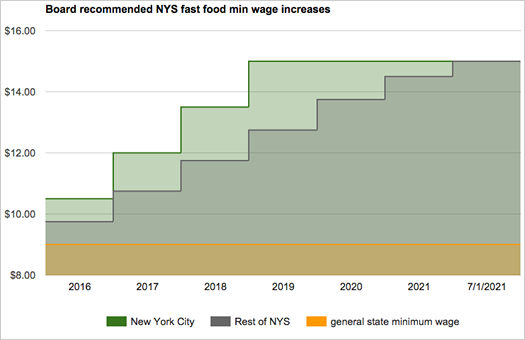 The state Fast Food Wage Board has recommended that the minimum wage for fast food employees across New York State rise to $15 per hour -- eventually. 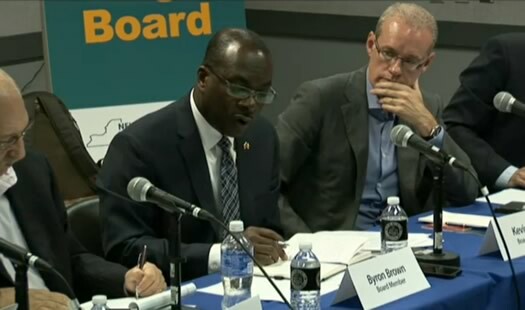 At its last scheduled public meeting Monday the state's Fast Food Wage Board didn't recommend a specific increase in the minimum wage for fast food workers in the state -- but its members' comments pointed toward them eventually recommending a significantly higher rate. 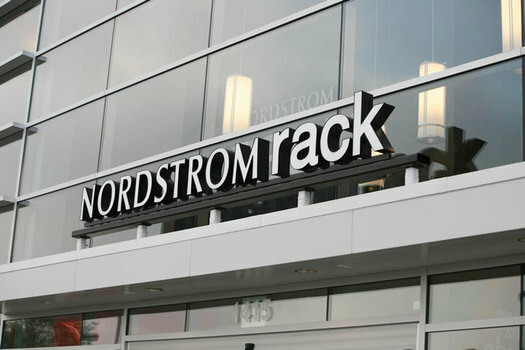 "There's no question in mind that we need a very substantial increase in the minimum wage," board member Kevin Ryan, the chairman and founder of the online shopping site Gilt, said. 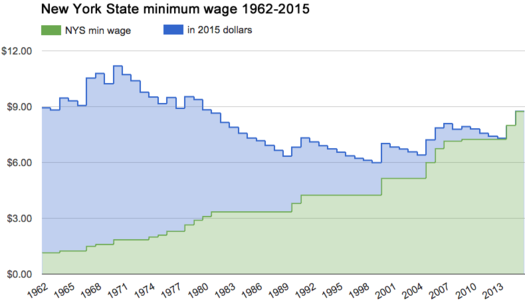 "When you look at the industry as a whole in this state, we really should be looking at one wage rate for the state, and that should be $15 and that should be as soon as possible," said board member Mike Fishman, the secretary treasurer of Service Employees International Union. 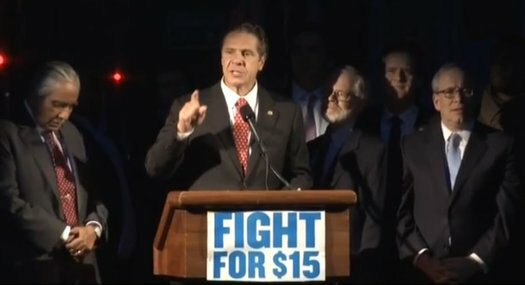 The fast food wage board was empaneled by the state Department of Labor at Andrew Cuomo's direction in May to consider raising the minimum wage in the industry. The Cuomo admin says the board's recommendation can be enacted without legislation. 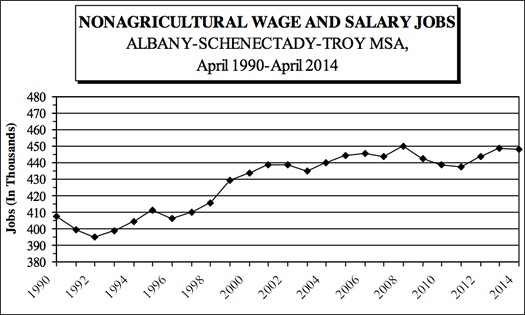 The Capital Region labor force since 2000. Here's a bigger version. New York State's unemployment rate was 5.6 percent in September, down from 7.4 percent the year before. 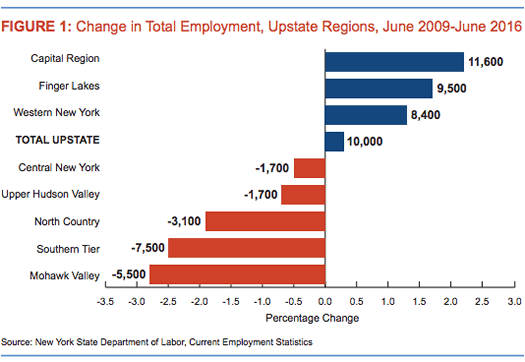 And the upstate unemployment rate was 5.5 percent, down from 6.9 percent the year before. The numbers for September continue a trend for the Capital Region in which each month's unemployment rate has been lower than that same month the year before, dating back to 2012 November. A map created by the Tax Foundation based on its calculations, the deeper the blue the higher the percentage of income in a state that goes to state and local taxes. New York State once again topped the Tax Foundation's annual list of highest state-local "tax burdens" as a percentage of income. The think tank calculates that 12.6 percent of income in New York goes to state and local taxes . (The US average is 9.8 percent.) 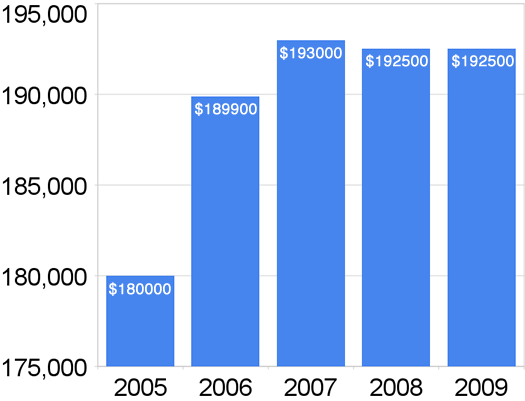 The figures are for fiscal year 2011. It's the third straight year New York has topped the list. 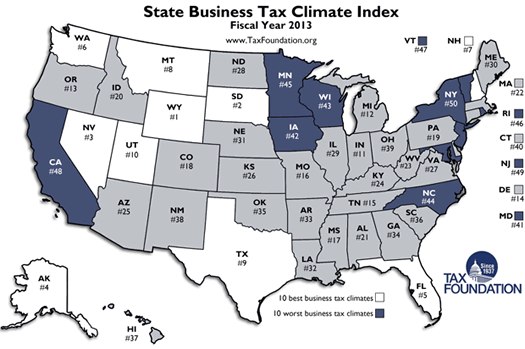 It's joined in the top three by New Jersey and Connecticut, a trio the Tax Foundation reports has held the three spots since 2005. Somewhat interesting to us: New York's rate has more or less held steady over the last 35 years, according to the rankings. New York's place in the top spot isn't surprising. But when it comes to these sorts of lists we'd like to also see what people are (or aren't) getting for the taxes they pay. A small, localized example: Property taxes in the city of Albany tend to be higher than some of the surrounding suburbs, but those taxes cover services -- like garbage collection -- that you might have to pay for separately somewhere else. Highlighting what people are getting for their taxes wouldn't necessarily let New York State off the hook for its high-tax rep. But it might make some of the trade-offs more clear and specific. The Tax Foundation describes itself as an "independent tax policy research organization." Here's a run through of the methodology for its tax/income calculations. The Cuomo admin has been pushing consolidation and shared services as a way for local governments to save money (and, you know, not raise taxes). 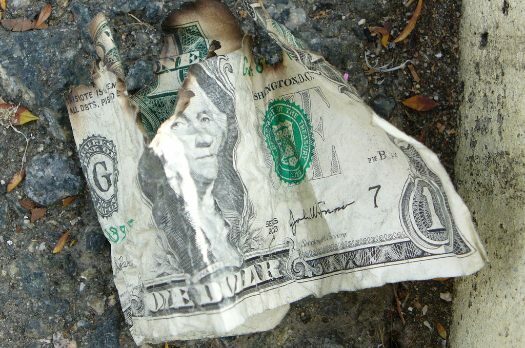 Over at Capital, Jimmy Vielkind has an article looking at the issue of New York's many, many layers of local of government -- and finds some of these layers more or less only exist on paper, and the touted savings from consolidation could be hard to come by. As if often mentioned, the unemployment rate includes people who are actively looking for a job. So it doesn't necessarily provide a picture of how many people have become frustrated and stopped looking, chosen a different path because employment prospects aren't good (examples: going to school, staying home with a kid), are under-employed -- or some combination of all the above. * Unemployment rates for counties are not seasonally adjusted, so the best comparison is the same month in previous years. ** State rate is seasonally adjusted. The unemployment rate in New York State was 7.6 percent in May -- the lowest mark since February 2009, according to the state Department of Labor. From May 2012 to May 2013 the state added 104,200 private sector jobs -- but that was blunted a bit by the loss of 18,500 public sector jobs (14,400 at the local level). During that same period, the Albany-Schenectady-Troy metro added 2,200 private sector jobs -- but lost 600 public sector jobs. After the public sector, the industry to lose the most jobs statewide over the last year: manufacturing, down 13,300. There were about 730k unemployed people in New York in May. 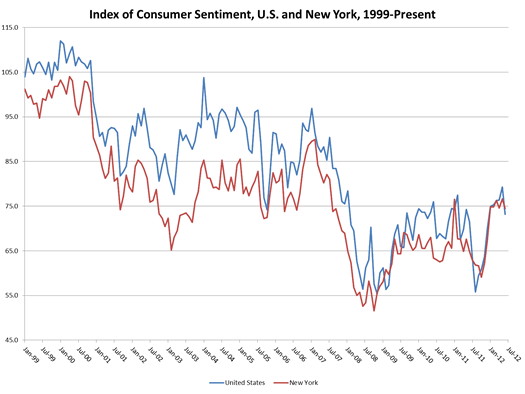 Consumer sentiment, from 1999 to the present -- via SRI. The Siena Research Institute released consumer confidence figures today for metropolitan areas around the state. SRI reports that consumer confidence was up in every metro during the 3rd quarter of this year compared to the same period last year -- though it's down a bit in many metros compared to the last quarter. The Capital Region's Q3 figure was up 13 percent compared to the same period last year -- and down about 6 percent compared to the previous quarter). Last week, SRI released numbers for the state as whole -- and September's figure was the highest in five years. Interesting bit: there was a huge gap between Democrats (95) and Republicans (58) -- 37 points -- the largest ever measured by SRI. In general, rising consumer confidence is a sign that people think things are getting better and are more willing to spend money. That's usually a good thing for the economy. 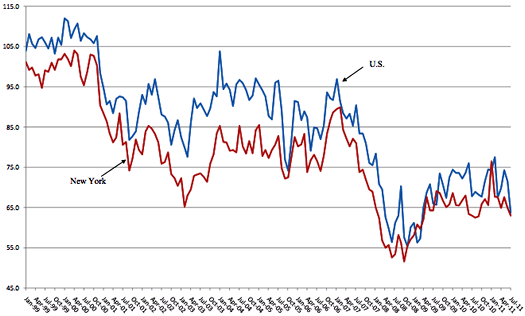 The decade: The thing that really caught our eye today while browsing the SRI site: the chart above, which tracks consumer sentiment for both the nation (blue) and state (red) since 1999 until the present. It's not surprising -- and things appear to be getting better -- but, oof, the chart's another illustration it's been a rough decade or so. Almost none of these things are not like the others. The Country Knolls neighborhood in Clifton Park has the smallest income inequality of any place in the nation, according to the Census Bureau (with a handful of statistical caveats). That is, there's very little distance between the high and low ends of the income distribution there (Gini index of 0.214). Or, to put it simply, almost everyone there has just about the same level of household income. Country Knolls CDP NY, part of the Albany Urbanized Area about halfway between Albany and Saratoga Springs NY (see Map 2), has the lowest measured income inequality (though not different from the others in the table because of the small sample sizes)--0.214, or 46 percent of the U.S. figure.21 In these small places with low inequality, sorting is likely the source of the homogeneity in income. 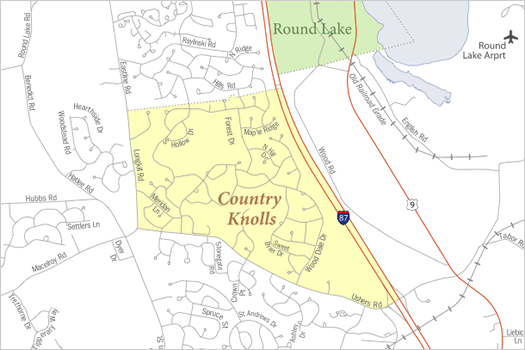 For example, in Country Knolls in 2005-2009, 96 percent of the people were White non-Hispanic; 85 percent of households are married-couple households; 97 percent of the people at least 1 year old were living in the same residence 1 year earlier; 26 percent of people 25 years and over had a graduate or professional degree; the median income of households was $107,589; and only 9 of 609 housing units were renter-occupied (1.5 percent). 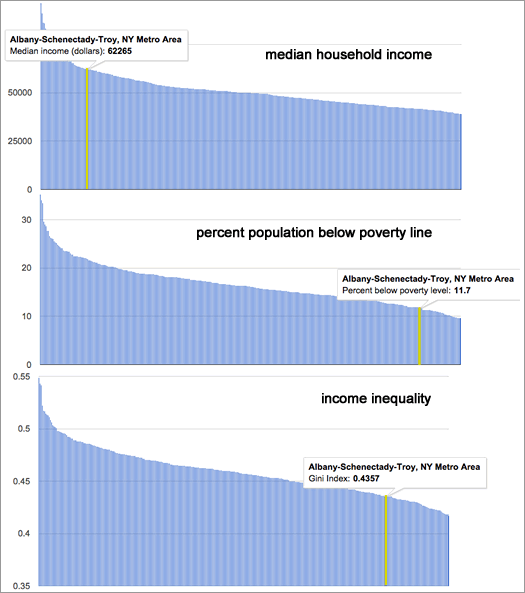 That median income would put a household somewhere close to the 80th percentile for income in the Capital Region. A tip of the hat to the TU's Chris Churchill for noticing this. And The Biz Review talked about it with Clifton Park supervisor Phil Barrett, who lives in that neighborhood. 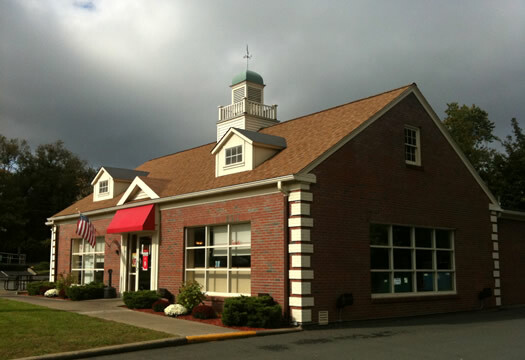 The Friendly's in Guilderland. Apparently those clouds were a portent. 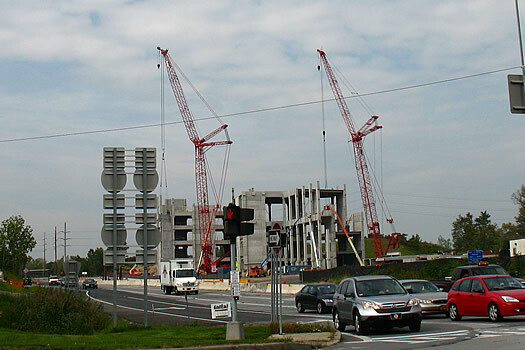 The construction at the Albany NanoTech expansion today. Andrew Cuomo announced today that a consortium of tech companies will be investing $4.4 billion in chip fab research facilities around the state. 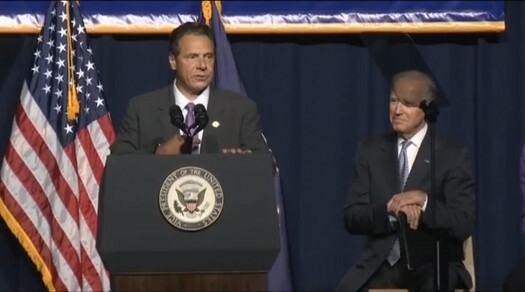 The Cuomo admin says the research effort will create and/or retain 6,900 jobs -- 800 of them at UAlbany's College of Nanoscale Science and Engineering (CNSE) complex. 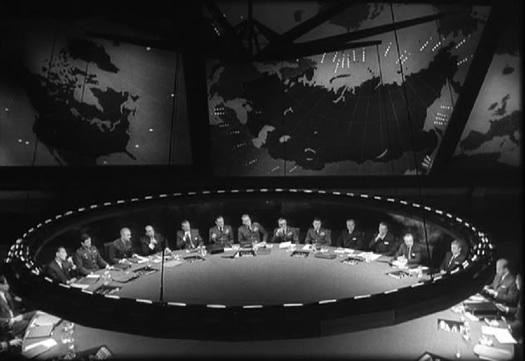 You'll recognize many of the names of the corporations involved: Intel, IBM, GLOBALFOUNDRIES, TSMC and Samsung. Said Cuomo this morning at the NY Open for Business conference at the ESP: "These companies could have gone anywhere on the globe ... they're investing right here in New York." In addition to Albany NanoTech, there will also be investment at IBM in Fishkill, SUNYIT in Utica, and CNSE's facility in Canandaigua. The state is putting $400 million toward this effort, which the Cuomo admin says will go directly to CNSE at UAlbany -- and all the tools and equipment will belong to the college. The research will focus on making computer chips from 450 mm wafers. Current technology uses 300 mm wafers, and the larger size offers the potential of cheaper, faster chips. As an Intel exec told the audience today: "[450 mm] allows us to continue Moore's Law in an economic way." It's probably fair to say Cuomo was stoked this morning. As he crowed at one point during his remarks: "We won a very important competition globally. ... Why? Because we are New York. That's why we won it." Even with the decline in unemployment rate, the Capital Region still had fewer people employed this past August compared to a year ago -- about 4,000 fewer people. 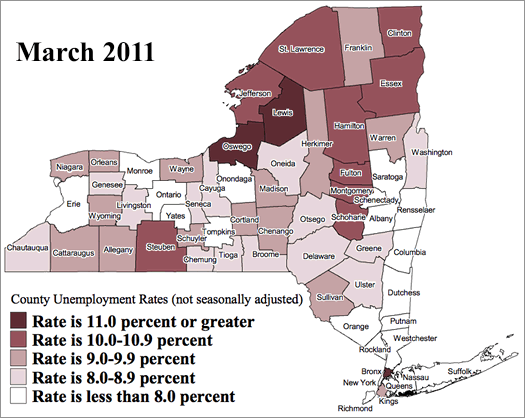 There were just under 30,000 people unemployed in the Capital Region last month. 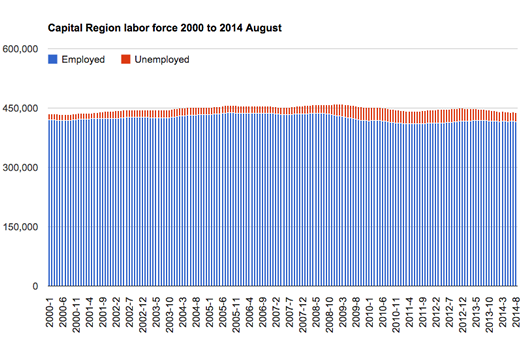 The state's unemployment rate was 7.7 percent, down from 8.3 percent in August 2010. The national unemployment rate was 9.1 percent. Breakouts for local counties after the jump. 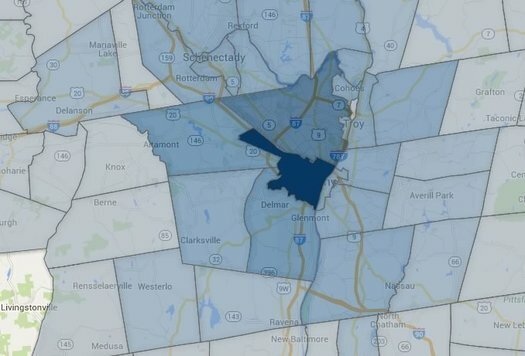 Saratoga County had one of the lowest rates in the state. 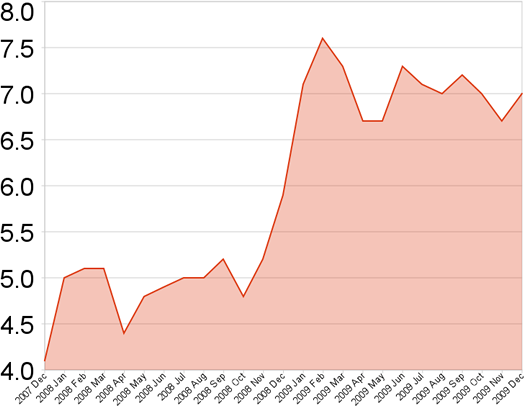 A chart of consumer confidence since 1999. 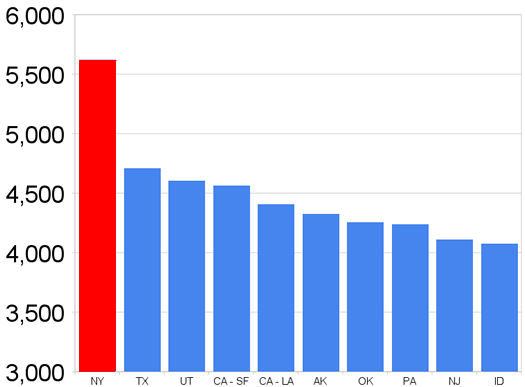 The red line is New York State, the blue line is the nation. 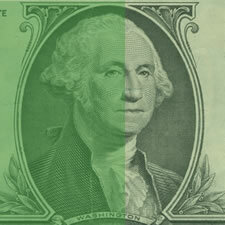 Were you as spooked by the debt ceiling debacle as everyone else seems to have been? A new Consumer Confidence poll released today by the Siena Research Institute shows that people are feeling pretty down about the current state of the economy and even more bleak about the future. 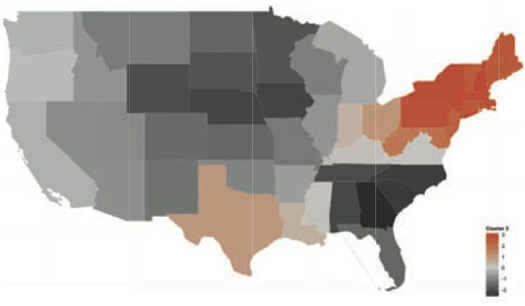 Siena polled the state as a whole and also separated out the numbers for upstate as compared to New York City. Across the state, consumer confidence has fallen by 1.9 percent. In the upstate area, it's fallen by 3.1 percent. And that's just the overall number. When confidence in the economic future is measured, the numbers get even worse, with upstate confidence falling by a whopping 8 percent. This chart on Siena Institute's main page shows how precipitously consumer confidence has fallen in the country and state since 1999. 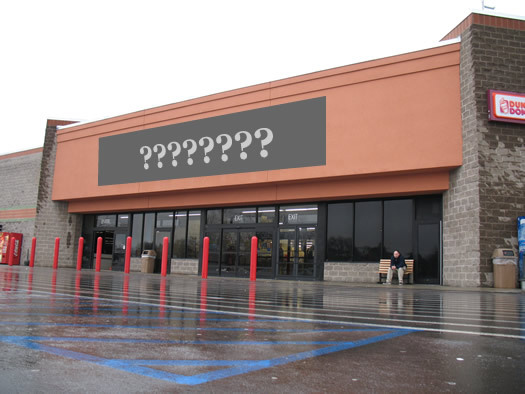 What are your thoughts on the current economy? Are you, your family and friends better off financially than you were a year ago? What do you expect your financial situation will be a year from now? The Capital Region's unemployment rate was 7.2 percent last month, according to numbers out today from the state Department of Labor. That's down from 7.7 percent a year ago and 7.8 percent last month. New York State's unemployment rate was 8 percent last month. That's down from 9.1 percent a year ago, and 8.7 last month. 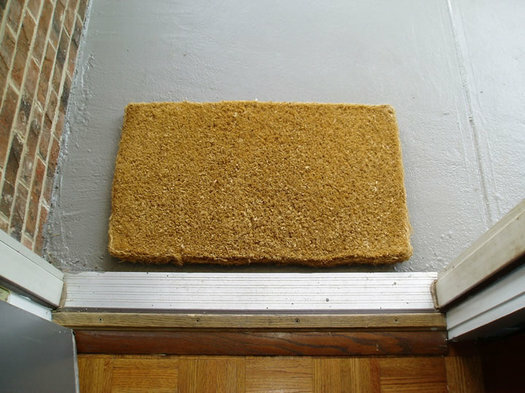 The national rate was 9.2 percent, down from 10.2 percent a year ago, and 9.5 percent last month. 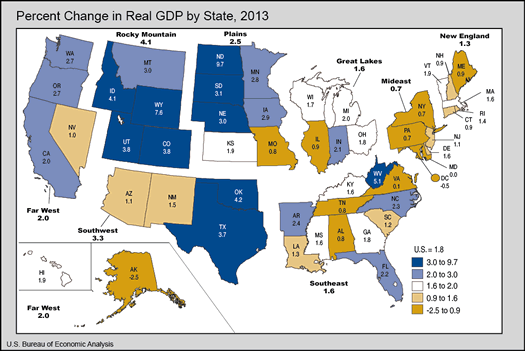 Compared to the rest of the state, the Capital Region is doing relatively well. The Capital Region's rate was lower than all over metro areas in the state aside from Ithaca (5.4 percent) and the suburban counties around NYC (6.9 percent). Zooming in a little more, individual Capital Region counties are doing even better compared to the rest of the state. Albany County's 6.8 percent rate was tied for sixth lowest in the state (with New York county). And Saratoga was right behind it at 6.9 percent. In fact, all four core counties of the Capital Region rank in the top 20 for lowest rates statewide. 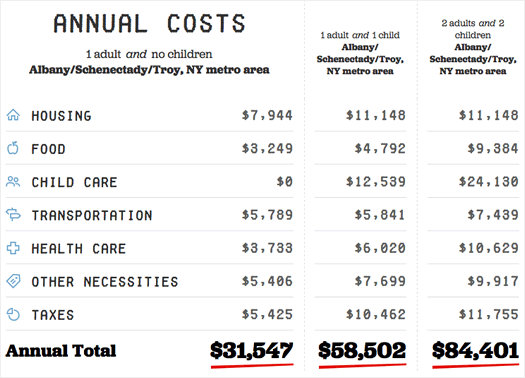 (The metro area's rate would be lower if not for Schoharie County, which the DOL includes in this metro, at 10.6). There are still about 30,000 people in the Capital Region who are unemployed. Numbers not seasonally adjusted, so the best comparison is to the same month a year ago. The Capital Region's unemployment rate was 7 percent in November, according to the state Department of Labor. That's up from 6.7 percent in November 2009. The region is down about 3,000 jobs compared to a year ago. There were more than 31,000 unemployed people in the Capital Region in November. New York State's unemployment rate was 8.3 percent in November -- up from 8.2 percent in October and down from 8.9 percent in November 2009. The total job count in the state was down 300 last month. 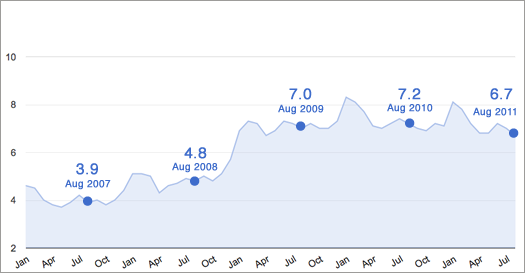 The national unemployment rate was 9.8 percent last month -- up from 9.6 in October and 10 in November 2009. Anecdotal, but... We feel like we got a small view into the job market via the hiring process for the associate editor job with AOA. It's been sobering. We got a lot of applications. And a lot of those people have skills and experience. There just aren't that many opportunities out there right now. All data from NYS DOL. Capital Region data are not seasonally adjusted, so it's best to compare the same month from different years. 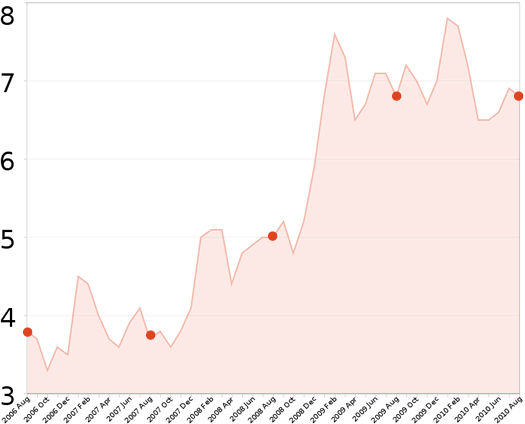 State level data is adjusted, so if you'd like to compare one month to the next, go for it. When the transition is complete, Sematech will have moved all of its operations from Austin to Albany. Put that in your breakfast taco. All together, there's now been more than $6.5 billion worth of investment at Albany NanoTech. The higher the number, the more confident. 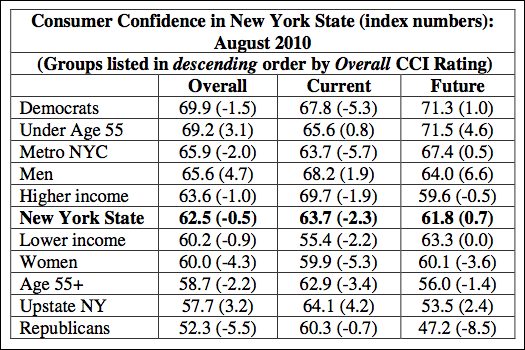 Check out this table from the Siena Research Institute's monthly New York State consumer confidence index. Look at the split between Democrats and Republicans for confidence about the future of the economy. There's also a relatively wide split between upstate and NYC. 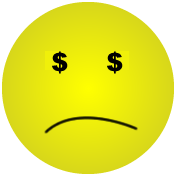 Statewide our numbers are weak and depict worried consumers very reluctant to spend. Under the hood, we see Democrats saying the economic glass is nearly half full, but Republicans, 25 future index points lower, are now more pessimistic about their own prospects as well as the five-year state outlook than they have been since we began measuring consumer confidence in 1999. Over six of every ten Republicans expect poor business conditions in New York this year and widespread unemployment through 2015. Democrats forecast a somewhat rosier picture for the state and are much more likely than Republicans to insist that somehow, someway, they personally will be better off in a year. As NYT reported earlier this week, New York City has fared relatively well during the recession (relative being the key word) -- and things are looking up there. That might explain some of the split -- both political and geographic. Scott Kellogg wants to teach you to live greener and be more self-sustaining -- you know, grow your own food, raise a little livestock. 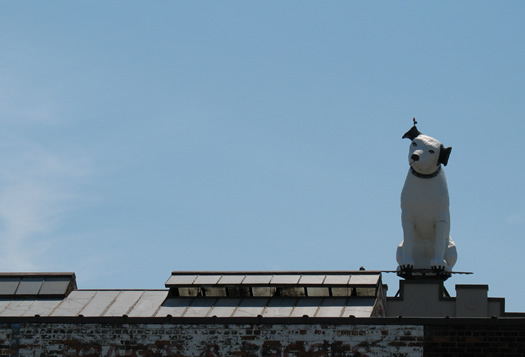 Hey, city dwellers -- this means you. 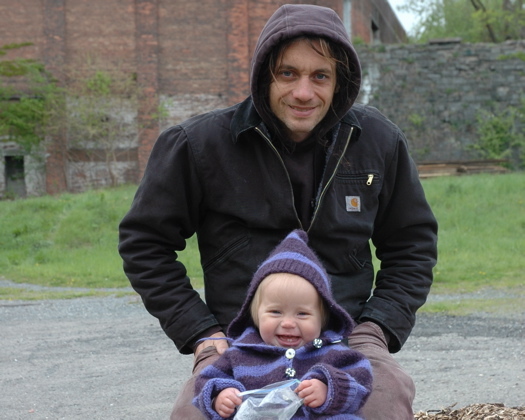 Now they live in Albany, and they're building a space called The Radix Center to teach city dwellers and suburbanites alike to do everything from compost with worms and grow porch mushrooms, to collect rainwater and raise their own fish. Scott says not only is this possible, you're actually going to enjoy it. Going on more than three centuries. But, whatever... let's kick this around a little bit. Median sale prices. Just a reminder: it's one month of data, so take it with a grain of salt. The number of closed home sales was down 38 percent in July compared the same period last year, according to Greater Capital Association of Realtors. 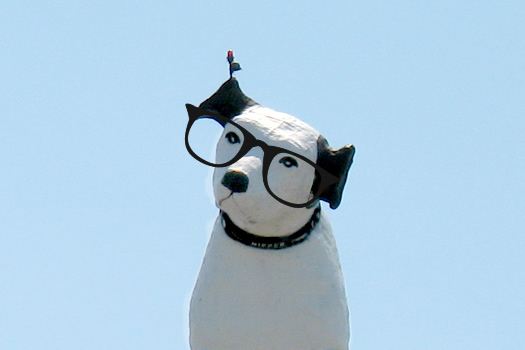 * But get this: the median sale price was up five percent -- to $199,000 (year to date prices are up slightly, too). 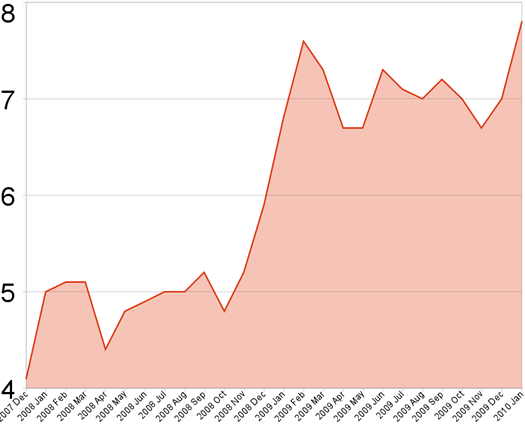 The steep drop in the number of sales probably is a result of the federal tax credit that ended earlier this year -- a lot of house buying was probably crammed in before the deadline. There are still a lot of houses out there, though. GCAR reports the market has 12.5 "months supply of inventory." And the number of days on the market for the average house is 86 -- that's up about five percent over last year. By the way: If you already own a house -- and think you'll be there for at least a few years -- it might be a good idea to look a refinancing. Rates are extraordinarily low right (you can get a 15 year mortgage for around 4 percent). Refinancing could save you a lot of money in the long run (even with New York's high closing costs). 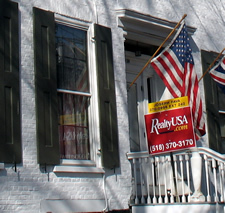 People in the Capital Region are optimistic about the housing market here, according to a Siena Research Institute report out this week. In fact, people are more optimistic about the housing market here over the next year than in any other part of the state. Also, SRI reports that sentiment here is strongly leaning toward this being a buyer's market right now. That's not really surprising. The median sales price for single family homes in the Capital Region is now about the same as it was five years ago, according to the Greater Capital Region Association of Realtors. And while the "months supply of inventory" has been down recently, it's still relatively high compared to the last five years. The strong optimism for the future is a little harder to figure. 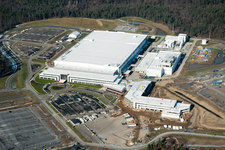 Is it a result of GlobalFoundries? Or maybe a byproduct of the fact the housing market here never really went in the tank like it did other places? Every week there seems to be some story about how a local county or other municipality (or, well, the state itself) is scraping for cash. The chart above, from the state comptroller's office, might shed some light on why. 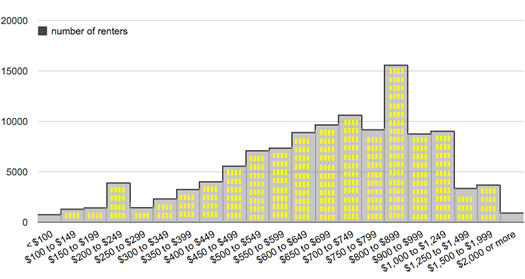 The chart tracks sales tax collections for counties outside NYC over the last five years. 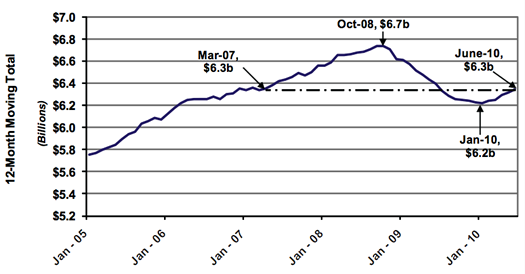 As you can see, revenues are headed back up again -- but they're still only at the March 2007 level. The comptroller's office reports that county sales tax collections outside NYC grew 3.7 percent during the first half of 2010 (they were down 6.9 percent during the first half of 2009). But collections in the Capital District were "essentially flat." Saratoga County did well -- its collections were up more than five percent. Albany, Schenectady and Rensselaer counties were all flat or down a bit, though. 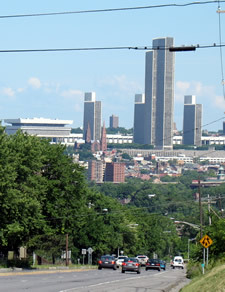 The Albany metro area ranked #18 for quality of life in an analysis by Portfolio.com of the nation's 67 biggest metros. Albany was just behind San Francisco and just ahead of Worcester. Raleigh was #1. The selection of categories highlights how tricky it is to figure something like "quality of life." Sure, people are probably happier when they have a short commute and don't have to scrape to pay the mortgage. But stats like that don't necessarily catch other important elements -- like weather, cultural opportunities or restaurant quality. 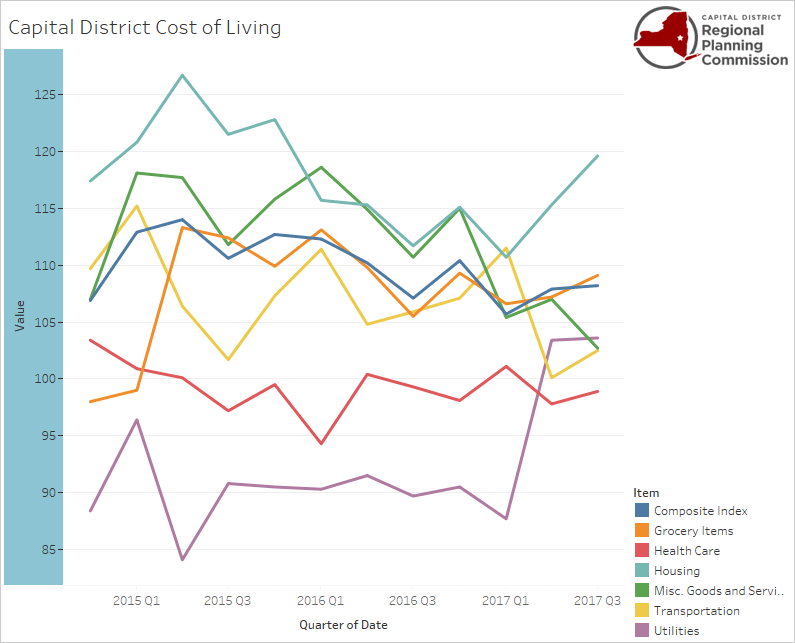 Cost of living: a coalition of local development groups has posted a cost of living calculator that compares other metro areas to the Capital Region. The calculator provides an overall cost comparison -- and it also breaks out individual items. 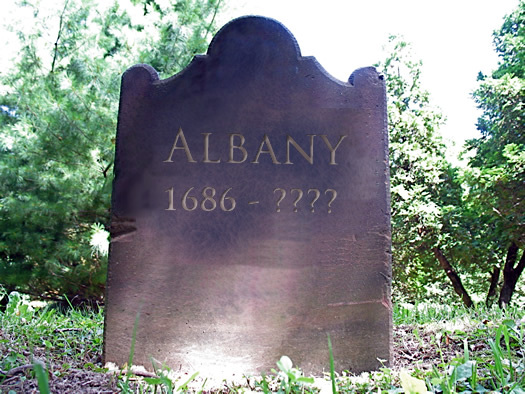 Earlier on AOA: Misconceptions about Albany? 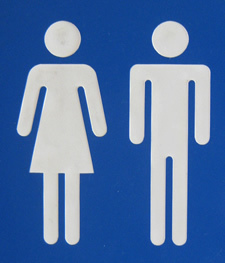 Wyoming has the smallest gap (women make 89 percent as much as men there). Alaska has the biggest (women at 64 percent). 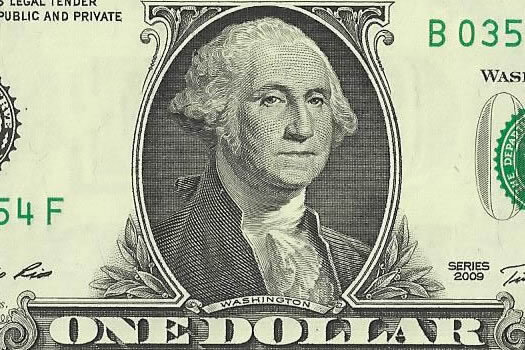 Nationally, women make 71 percent as much as men. A 2007 analysis by two researchers at AAUW reports that even when controlling for factors such as experience (including work hours), training, education, and personal characteristics, men still make five percent more than women. The Harvard Business Review has a whole section dedicated to pay gap issues this month. This article about "delusions of progress" for women in management was particularly interesting. 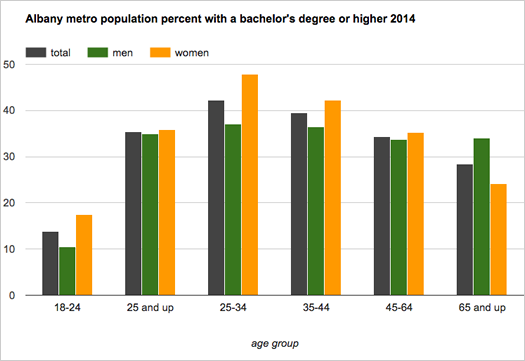 *That's for "median earnings for ... male and female full-time, year-round college-educated workers, ages 25 and older." The gap is smaller -- and New York ranks one spot better -- for "median earnings for ... male and female full-time, year-round workers, ages 16 and older, all educational levels." 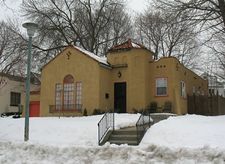 The data are from the Census Bureau's 2008 American Community Survey. + A focus on entrepreneurialism, including mentoring and support for startups. + A "cradle to career" education pipeline. Initiatives include an effort to reduce new teacher attrition and more co-op jobs. + Focus on health care -- research and jobs. + Increasing presence in local communities. Among the initiatives for this focus: more student volunteer work and "study abroad" opportunities within the state (well, Long Island is sort of like its own country). Step one for the plan apparently was branding the university system to look like a biotech company (brochure cover on the right). 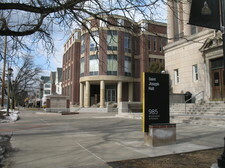 SUNY has 64 campuses and almost 465,000 students. 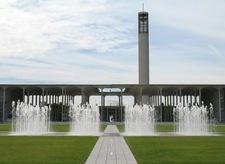 About 18,000 of those students are at UAlbany. 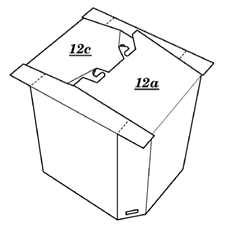 Among the Capital Region patents: a Schenectady company was a issued a patent for locking box lid flaps (image to the right). The raw numbers of unemployment send it home for us, though: more than 35,000 in the Capital Region were counted as unemployed last month. 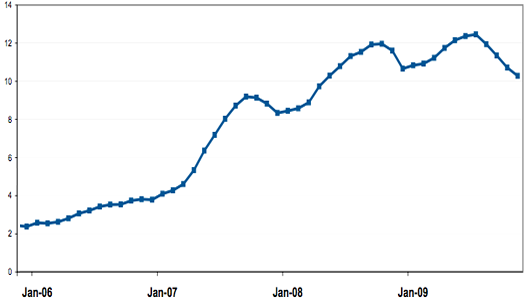 The labor department also released its revised numbers for all of 2009. 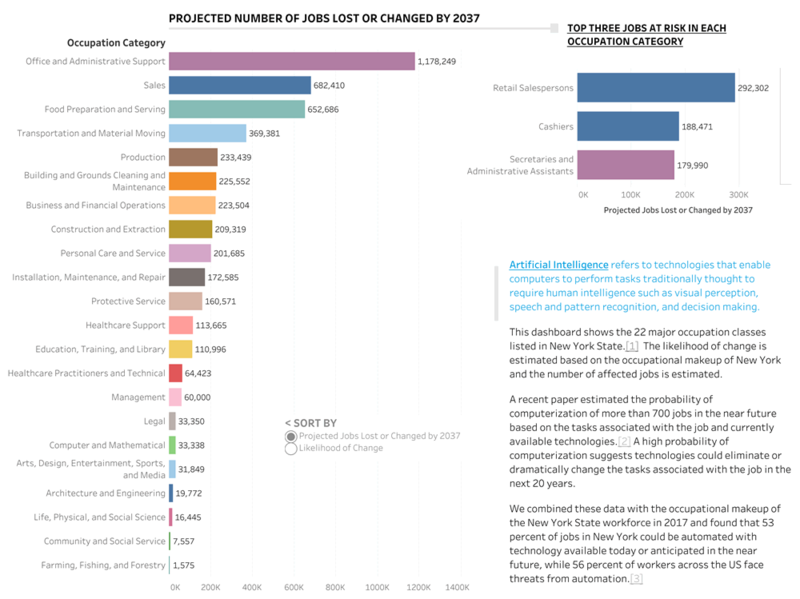 It reports that the average number of the jobs in the Capital Region declined 2.6 percent last year compared to 2008 -- that was one of the smallest drops in the state. The county-by-county breakdown for the Capital Region is after the jump. Here are the median home sales prices for the Capital Region in January, as reported by the Greater Capital Association of Realtors. GCAR's CEO notes in a press release that homes on the lower end of the price spectrum continue to sell more quickly than homes on the higher end, perhaps because of the first-time homebuyer tax credit. Our housing market is overvalued? 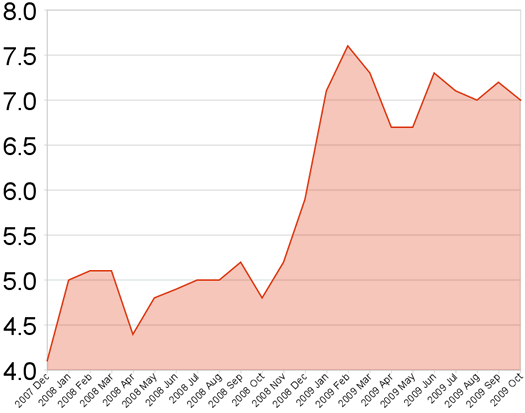 By the way: the Capital Region had one of the nation's lowest rates of home foreclosure in 2009. + What's the price of a little extra style? The Greater Capital Association of Realtors (GCAR, to its friends) recently started including breakdowns of home sales data by city in its monthly stats release. 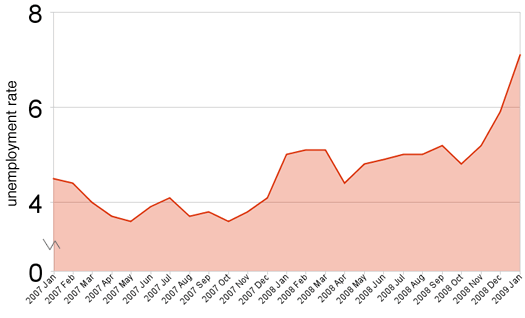 GCAR released the December numbers yesterday, so there's now data for all of 2009. We thought it'd be interesting to see how the median home prices in various cities and towns in the Capital Region stacked up for the year. The Capital Region's unemployment rate was 7 percent in December, according to the state Department of Labor. That's up from 6.7 percent in November -- and 5.9 percent in December 2008 (that's the best comparison because the numbers are seasonally adjusted). The number that strikes us about the unemployment data is the raw total: more than 31,000 people are unemployed in the Capital Region. The labor department includes Schoharie County in the Capital Region rate, which probably skews things a bit. Schoharie's unemployment rate was pegged at 9.2 percent in December. The county-by-county breakdown is after the jump. The state's overall unemployment rate was 8.8 percent in December, up from 8.4 percent the month before and 6.8 percent a year ago. State unemployment rate corrected Friday morning. Forbes has ranked the Albany metro area the sixth best among "cheap cities." David Paterson at today's budget proposal release. 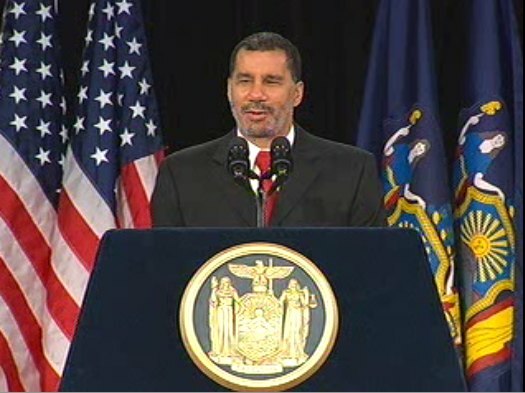 David Paterson released his proposed 2009-2010 budget today. In a short speech, Paterson reiterated that this is the worst fiscal crisis the state has faced since The Great Depression. He also said the proposed budget is not perfect and that he welcomes critiques and other ideas -- though he said that "endless ridicule" is not helpful. Here's a very quick summary. 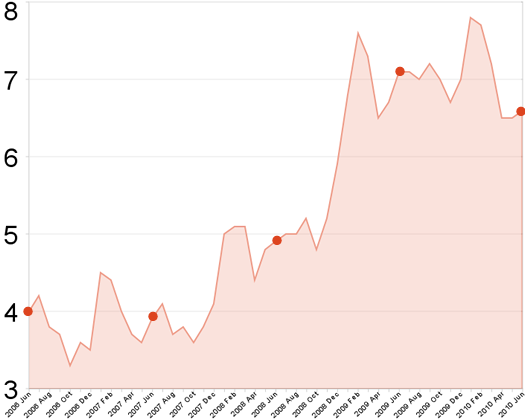 The state released last month's unemployment data today. The short story: the Capital Region's unemployment rate in October was 4.9 percent -- that's up from 3.6 percent in October of last year. OK, so maybe that's not surprising given the way the economy's been going. 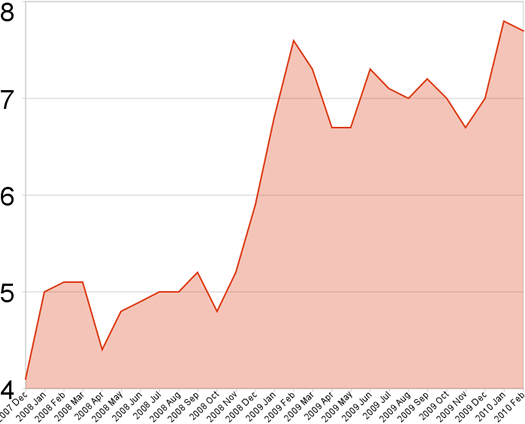 But get this: the number of jobs in the Capital Region over that time period didn't change. David Paterson unveiled his plan for cutting $2 billion from the current state budget today. He says this plan will cut $2 billion from this year's budget and $3.2 billion from next year's (in which a $12.5 billion gap has already been projected). We've put together a quick rundown of the cuts/savings. It includes some possibly bad news for Saratoga. All around the Capital Region, municipalities are getting their budgets ready for next year. 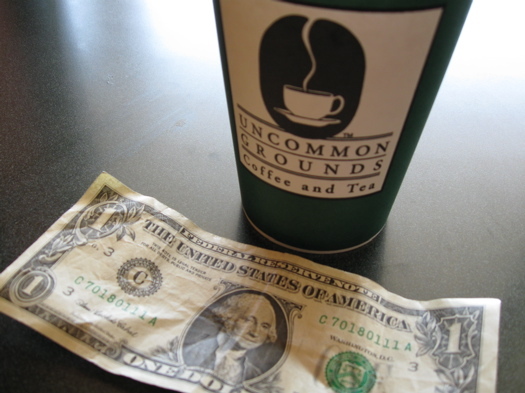 And you know what that often means -- yep, tax increases. 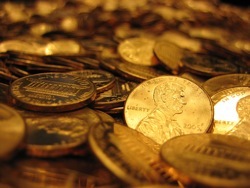 We've pulled together a list of proposed tax increases from around the area. It's not a comprehensive list, but it gives you a sense of how things are stacking up. According to an analysis by Moody's Economy.com, the answer is: yes. 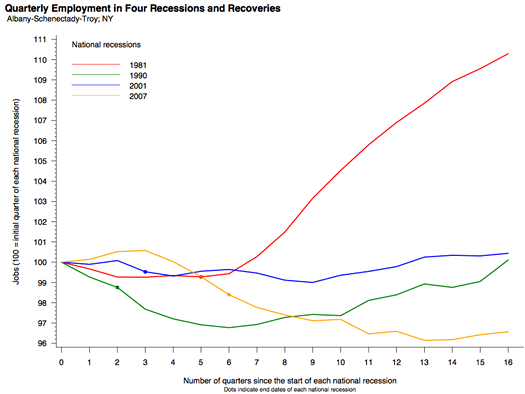 The US as a whole is not officially in recession -- at least, not yet. That designation is made by the National Bureau of Economic Research, which isn't currently using the "r" word.